MongoDB Aggregation Framework groups set of documents together and performs certain operation on this grouped documents and returns results in the form of documents. MongoDB aggregation answer to those query which requires grouping of documents. Now let see how MongoDB Aggregation Framework works with simple example. Suppose you are MongoDB application developer in a respected company and you have been given a MongoDB database that holds information about human population which is distributed according to cities and their states. here is one sample document. for this tutorial collection name is zips. on first day your manager come and asks you to calculate total population of state DC. your simplest approach to solve above query would be find all documents which have DC as state. then iterate them one by one and add population to a variable. This works fine and given task is done. later, next day your manager comes and tells you to find total population of each states. now this query is little tricky, but you would modify you first MongoDB script and make it is given below. yes, it will give you expected result. no doubt you are a good MongoDB developer. but you have put extra efforts get result. it does not mean that you are not a good developer, rather you are not aware of MongoDB aggregation framework which produce expected result in one query. it will give you same result which in equivalent of second MongoDB script. now let see how it works. First look out the group clause of aggregate query. as documents are grouped now we can perform calculation on them like summation of population. 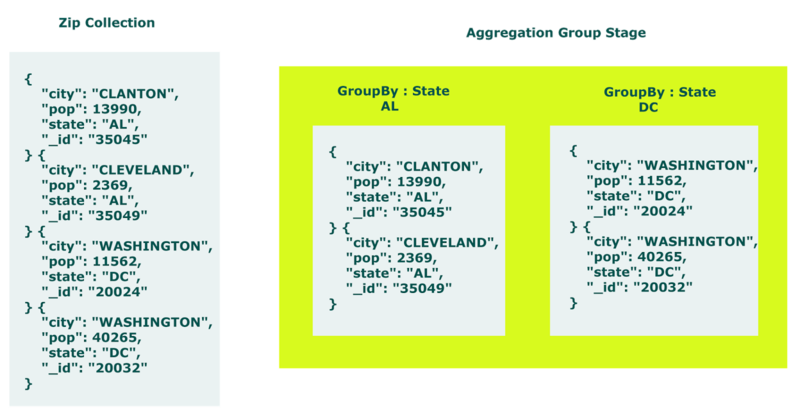 hence you get expected result in one query using MongoDB Aggregation Framework. Really you have enclosed very good informations.please furnish more informations in future.